This is just one example of many custom printed plastic bag programs we have that you can choose from for your retail store. Let your imagination flow and choose the exact plastic bag you want. These plastic retail bags are made with 15%-25% recycled material consisting of a combination of post-industrial and post-consumer resins with a minimum of 5% post-consumer recycled (PCR). You choose the bag size, color, thickness and print to create just the image you want for your retail store. Pricing is based on 25% ink coverage. LEAD TIME: 4-6 weeks after art approval. FOB Vernon, CA. All bags are priced per 1000 (M) bags. 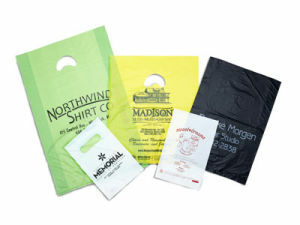 Special Colors - Add 5% to pricing for bag colors: Cirtus Green, Dark Purple, Magenta, and Navy.